Russell Amos Kirk (October 19, 1918 – April 29, 1994) was an American political theorist, moralist, historian, social critic, and literary critic, known for his influence on 20th-century American conservatism. His 1953 book The Conservative Mind gave shape to the amorphous post–World War II conservative movement. It traced the development of conservative thought in the Anglo-American tradition, giving special importance to the ideas of Edmund Burke. Kirk was considered the chief proponent of traditionalist conservatism. He was also an accomplished author of Gothic and ghost story fiction. 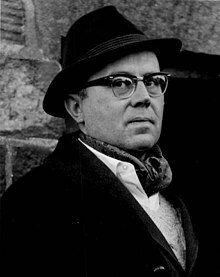 Russell Kirk was born in Plymouth, Michigan. He was the son of Russell Andrew Kirk, a railroad engineer, and Marjorie Pierce Kirk. Kirk obtained his B.A. at Michigan State University and a M.A. at Duke University. During World War II, he served in the American armed forces and corresponded with a libertarian writer, Isabel Paterson, who helped to shape his early political thought. After reading Albert Jay Nock's book, Our Enemy, the State, he engaged in a similar correspondence with him. After the war, he attended the University of St. Andrews in Scotland. In 1953, he became the only American to be awarded the degree of Doctor of Letters by that university. Upon completing his studies, Kirk took up an academic position at his alma mater, Michigan State. He resigned in 1959, after having become disenchanted with the rapid growth in student number and emphasis on intercollegiate athletics and technical training at the expense of the traditional liberal arts. Thereafter he referred to Michigan State as "Cow College" or "Behemoth University." He later wrote that academic political scientists and sociologists were "as a breed—dull dogs". Late in life, he taught one semester a year at Hillsdale College, where he was Distinguished Visiting Professor of Humanities. As Birzer's study demonstrates, Kirk's understanding of conservatism was so unique, idiosyncratic, transcendental, elitist, and in certain respects premodern and European, that it bore little resemblance to political conservatism in the United States. Conservative Mind successfully launched an intellectual challenge to postwar liberalism, but the variety of conservatism Kirk preferred found few takers, even within the American Right. Harry Jaffa (a student of Leo Strauss) wrote: "Kirk was a poor Burke scholar. Burke's attack on metaphysical reasoning related only to modern philosophy's attempt to eliminate skeptical doubt from its premises and hence from its conclusions." Beyond his scholarly achievements, Kirk was talented both as an oral storyteller and as an author of genre fiction, most notably in his telling of consummate ghost stories in the classic tradition of Sheridan Le Fanu, M. R. James, Oliver Onions, and H. Russell Wakefield. He also wrote other admired and much-anthologized works that are variously classified as horror, fantasy, science fiction, and political satire. These earned him plaudits from fellow creative writers as varied and distinguished as T. S. Eliot, Robert Aickman, Madeleine L'Engle, and Ray Bradbury. ^ "About Russell Kirk". kirkcenter.org. The Russell Kirk Center. 2014. ^ Kirk, Russell, ed., 1982. The Portable Conservative Reader. Viking: xxxviii. ^ Many published in his The Politics of Prudence (1993) and Redeeming the Time (1998). ^ Timothy Stanley (February 8, 2012). "Buchanan's Revolution: How Pitchfork Pat raised a rebellion—and why it failed". The American Conservative. The American Ideas Institute. ^ "Update: The Latin Mass in America Today". Regina Magazine. ^ Kirk, Russell (November 28, 1962). "The Mechanical Jacobin". General Features. Retrieved March 7, 2019. As republished in The University Bookman, November 10, 2017. ^ Harry V. Jaffa (April 13, 2006). "Harry V. Jaffa Responds to Claes Ryn". The Claremont Institute. Archived from the original on September 27, 2007. Retrieved May 10, 2007. ^ "The Volokh Conspiracy – Russell Kirk, Libertarianism, and Fusionism". volokh.com. ^ Machan, Tibor R. (August 1, 1988). "A Passionate Defense of Libertarianism". Lecture #165 on Political Thought. Heritage Foundation. OCLC 19009917. ^ "An Open Letter to Russell Kirk". fff.org. ^ Russell, Kirk (December 15, 1988). "The Neoconservatives: An Endangered Species". Lecture #178 on Political Thought. Heritage Foundation. ^ Scott P. Richert (2004). "Russell Kirk and the Negation of Ideology". Chronicles Magazine. Archived from the original on July 17, 2006. ^ She claimed that Kirk "said people like my husband and me put the interest of Israel before the interest of the United States, that we have a dual loyalty." Decter is the spouse of Norman Podhoretz. ^ "Archived copy". Archived from the original on March 3, 2012. Retrieved November 26, 2012. CS1 maint: Archived copy as title (link) Political Errors at the End of the Twentieth Century – Part I: Republican Errors By Russell Kirk . Accessed: November 26, 2012. ^  Do Conservatives Hate Their Own Founder? – Thomas E. Woods, Jr. Accessed: November 26, 2012. ^  Political Errors at the End of the 20th Century, Part III: International Errors. Policy Archive, April 1992. Accessed: November 26, 2012. ^ a b c "Archived copy". Archived from the original on March 3, 2012. Retrieved November 26, 2012. CS1 maint: Archived copy as title (link) Political Errors at the End of the Twentieth Century – Part I: Republican Errors By Russell Kirk . Accessed: 26 November 2012. Campbell, William F. (Fall 1994). "An Economist's Tribute to Russell Kirk". The Intercollegiate Review. The Intercollegiate Studies Institute (reprinted with permission by The Philadelphia Society). ISSN 0020-5249. OCLC 1716938. Archived from the original on February 22, 2010. Feser, Edward C. (2008). "Conservative Critique of Libertarianism". In Hamowy, Ronald (ed.). The Encyclopedia of Libertarianism. Thousand Oaks, CA: SAGE; Cato Institute. pp. 95–97. doi:10.4135/9781412965811.n62. ISBN 978-1-4129-6580-4. LCCN 2008009151. OCLC 750831024. Filler, Louis. "'The Wizard of Mecosta': Russell Kirk of Michigan," Michigan History, Vol 63 No 5 (Sept–Oct 1979). Fuller, Edmund. 'A Genre for Exploring the Reality of Evil." Wall Street Journal, July 23, 1979. Hennelly, Mark M. Jr., "Dark World Enough and Time," Gothic, Vol 2 No 1 (June 1980). Herron, Don. "The crepuscular Romantic: An Apprfeciation of the Fiction of Russell Kirk," 'The Romantist, No 3 (1979). Kirk, Russell, "Introduction: The Canon of Ghostly Tales" in The Scallion Stone by Canon basil A. Smith. Chapel Hill, NC: Whispers Press, 1980. --------, 2004. Russell Kirk and The Age of Ideology. University of Missouri Press. --------, 2006. "Kirk, Russell (1918–94)," in American Conservatism: An Encyclopedia ISI Books: 471–474. Biographical entry. Pournelle, Jerry, "Uncanny Tales of the Moral Imagination," University Bookman, Summer 1979, Vol XIX, No 4. Russell, Gerald J., 1996, "The Jurisprudence of Russell Kirk," Modern Age 38: 354–63. ISSN 0026-7457. Reviews Kirk's writings on law, 1976–93, exploring his notion of natural law, his emphasis on the importance of the English common law tradition, and his theories of change and continuity in legal history. Steiger, Brad. "A Note on Ghostly Phenomena in Russell Kirk's Old House at Mecosta, Michigan." Strange Powers of E.D.P., NY: Belmont Books, 1969. Sturgeon, Theodore, "A Viewpoint, a Dewpoint," National review, vol XIV No 6, Feb 12, 1963. The Imaginative Conservative A Resource for those who want to learn more about Dr. Kirk and his thought.